Anyone who has children has tried countless tactics to get them to eat more fruits and vegetables, but one major produce distributor may have just found an amazing way to use science in order to solve the age-old struggle of parents worldwide: The Dole Food Company just genetically engineered an apple that grows with a toy in it to encourage kids to eat more fruit! Finally! Thanks to Dole, the kids of the future will actually beg their parents for nutritious apples with toys inside of them instead of pizza and fries. 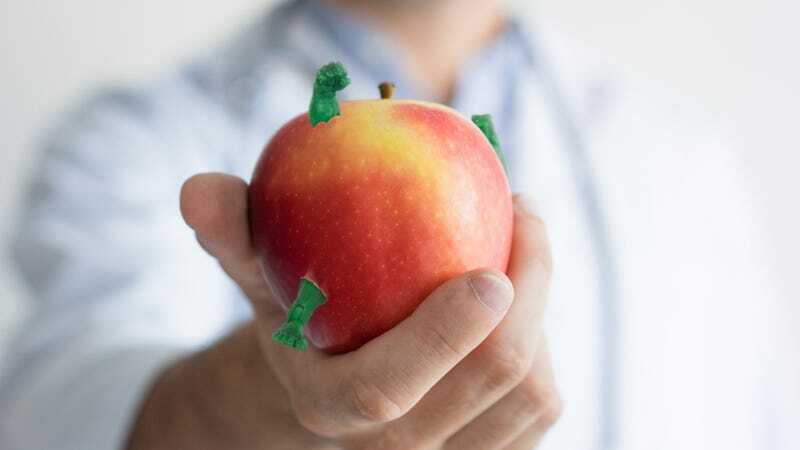 After years of development, genetic engineers at Dole have used cutting-edge biotechnology to create a breed of apple that can grow an okay-looking plastic figurine inside of it. Now when children bite into a Granny Smith or a Gala, they might just see the face of a toy soldier looking back at them from inside their healthy snack! Dole even has plans to partner with companies like Disney and Nickelodeon to one day grow figurines of classic characters like SpongeBob SquarePants or Mickey Mouse inside various types of fruit. Wow. There’s no doubt that kids are about to go wild for Dole’s new toy-filled apples. The company even says that they’re working on a method for making the toys non-toxic so that children no longer become sick when they eat their fruit! A whole generation of kids is about to find out just how exciting eating healthy foods can be!